1. In addition to the rates for stamps per 100 on our home page (click on Stamp Sales) we can supply 50s at one half of the 100 rates; also 1000 x 57p (as two stamps) @ �410.00. 2. We can supply most rates (not 57p) generally at 80% face. Please enquire by e-mail for any particular rates which you require. If particular supplies are out of stock we will supply the nearest available unless you wish us not to do so. 3. A charge of �1.00 applies to all orders to cover postage & packing. For urgent supplies you may request Special Delivery at a charge of �7.50. Special Delivery is used without further charge on orders �240 and above. Cash with order. Make your cheque payable to ISLE OF MAN SALES LTD and for added security write on your cheque between the crossing lines LLOYDS BANK PLC. Orders may be placed by email (no order form required)and payment made by computer transfer - ask us for account details. Even at weekends or evenings online �faster payment� transfers are generally received almost immediately, so payment online is encouraged, being more rapid and secure than cheque payments. We always confirm safe receipt of online payments. 4. We aim to despatch orders (unless holidays prevent us) within 48 hours. If there is a supply problem we will tell you. 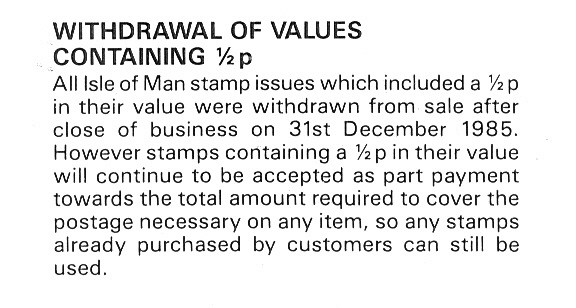 Our supplies were provided by Isle of Man Post or its sales agents and are subject to stock, being from surplus philatelic holdings. You may if you wish check availability by email. All prices are subject to revision without notice but you may verify particular prices by email which will confirm a price valid for the following seven days. 5. If you wish to state a preference between loose stamps and stamps in sheets please feel free to add a note to the order form and we will supply as best we can dependent upon our stock. Normally we provide �p stamps only in multi-value packs.